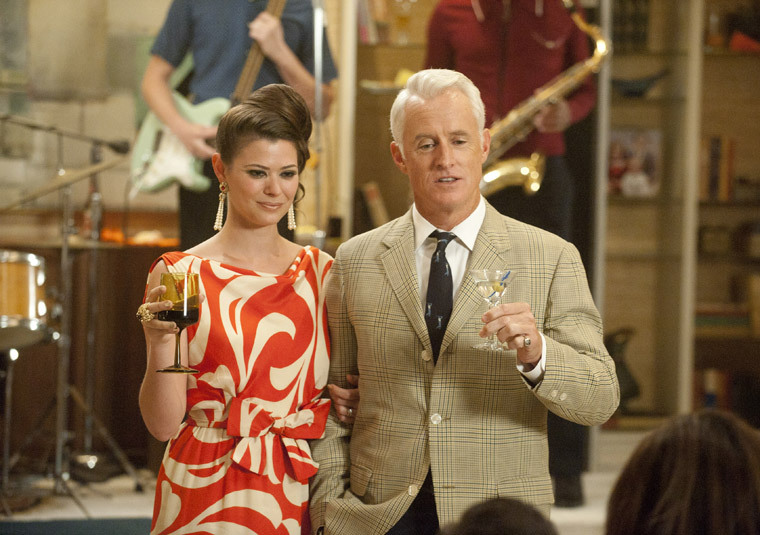 Jane and Roger Sterling (Peyton List and John Slattery) in Mad Men, season 5. Image via AMC. Meet McCall’s new designers. McCall’s Pattern Fashions & Home Decorating, Fall-Winter 1965–66. The original list of designers consisted of Larry Aldrich, Geoffrey Beene, Bill Blass, Laird-Knox, Digby Morton, Originala, Mollie Parnis, and Pauline Trigère, whose agreement with McCall’s dated to the mid-1950s. 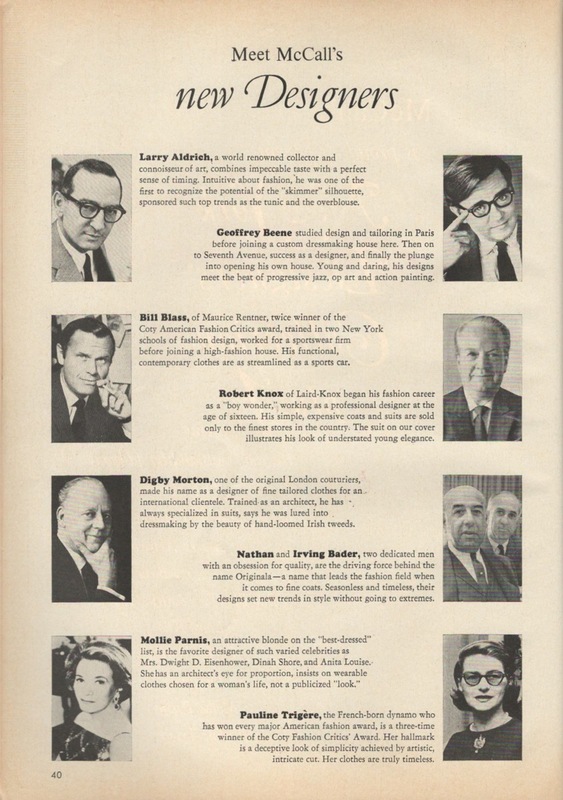 (Trigère was already featured in an earlier Mad Men era post.) Later additions would include Anne Klein, Jacques Tiffeau, and Rudi Gernreich. This post looks at three of the best-known American designers in McCall’s new line: Bill Blass, Geoffrey Beene, and Anne Klein. Born in Fort Wayne, Indiana, Bill Blass (1922-2002) showed an early talent for fashion design, studying briefly at Parsons before enlisting in the U.S. military in 1942. After the war he returned to New York to work in the fashion industry; by 1959 he was head designer for Maurice Rentner—then a conservative, established Seventh Avenue label. (McCall’s patterns credit the designer as ‘Bill Blass for Maurice Rentner, Ltd.’) In 1970 he purchased the company and renamed it Bill Blass Ltd. Blass was known for his sophisticated but youthful designs favoured by high society. He retired in 1999. McCall’s 8927 by Bill Blass (1967) Image via Etsy. Born in Louisiana as Samuel Robert Bozeman Jr., Geoffrey Beene (1924-2004) trained at the Traphagen School of Fashion in New York and École de la Chambre Syndicale in Paris, where he also apprenticed with a tailor. Returning to New York, he worked at Harmay and Teal Traina before founding his own company in 1963. Beene was renowned for his innovative, modern designs, as well as his iconoclasm. McCall’s 1028 by Geoffrey Beene (1968) Image via Etsy. Born in Brooklyn as Hannah Golofsky, Anne Klein (1923-1974) also trained at the Traphagen School of Fashion. The pioneer in American sportswear worked in petites and juniors before founding Anne Klein and Company in the late 1960s. Her final collection was completed by Donna Karan, who had begun work at the company in the summer of 1967 as Klein’s intern. McCall’s 1020 by Anne Klein (1967) Image via MOMSPatterns. All three New York designers would later make the switch to Vogue Patterns: Blass in 1967, Beene and Klein in the 1970s. Next: Butterick’s Young Designers: Mary Quant, Jean Muir, and Emmanuelle Khanh. LOVE this!! I had no idea Bill Blass went to Parson’s! So neat!